A refreshing salad that's perfect for lighter, springtime meals. If the weather's good, serve the salad cold instead, frying the apples and walnuts in the oil, then leaving to cool before tossing with the remaining uncooked ingredients. Cut the cheese into 1cm-thick slices. Mix together 1½ tablespoons of the walnut oil with the vinegar, honey and a little seasoning. Quarter and core the apples and cut into thick wedges. Cut each chicory head into thin wedges. Pull the tarragon leaves from the stalks. Heat the remaining oil in a large non-stick frying pan and fry the apple slices and walnuts for 2 minutes or until lightly browned. 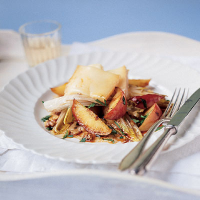 Add the chicory wedges and tarragon and fry, turning the ingredients together for a further 2 minutes. Using a slotted spoon, drain to warmed serving plates. Add the Taleggio slices to the pan and cook very briefly, turning once, until the cheese starts to melt, then pile the slices on top of the salad. Pour the dressing over and serve immediately, with warmed bread.